I was quite sure that my theory was correct about the fate of the main characters as well as the Kotoribako but I was still unprepared. I didn’t expect the reveal to be so disturbing. Espcially Myu-pon’s very own “What’s in the box”-moment was devastating. We now know for sure that the occultic nine are all dead and probably victims of what seems to be a government ploy covering up ...something. Occultic;Nine really solves one mystery just to present viewers with an even bigger one. I thought the main characters being dead and maybe ghosts or something akin to ghosts would prove that the ultimate answer to all the mysteries Occultic;Nine holds lie within the occult but with the new government-plot line I’m not too sure anymore. Tesla’s technology and lost wisdom were mentioned every now and then but I dismissed them as nothing but red herrings, yet now it appears that that technology was plot-relevant all along. However, this clue leads nowhere, so I’m not sure I should follow it. Luckily, this is exactly what this blog is for so let’s go and see where it takes us. Now, Tesla was interested in electromagnetic waves and Professor Hashigami said something along the lines of ghosts being similar to electromagnetic waves. Good. I’ve got nothing. No idea how Tesla, the government and a Frankenstein’s monster made out of 256 souls are connected. What we are able to say with relative certainty is that the 256 dead bodies found in the lake were all test subjects but for what? We finally got some answers and hints but they all seem to lead us nowhere. Ririka, whom I initially thought to be the main antagonist, seems to be another victim, though I still don’t trust her at all, while the Creepy Smile Kid, whom I saw as being Ririka’s familiar and nothing more, turned out to be a psychopathic monster. I don’t know why he created that child-stealing box or why he killed poor Chizu but I wouldn’t put it past him that he did so on a whim since his evil strikes me as the chaotic and random type. Ryotas, too, keeps getting more and more suspicious but I can’t quite put my finger on what exactly makes her so suspicious. Is it because she and the fan-service she’s subjected to seem so out of place? Maybe because she’s such a Manic Pixie Dream Girl that there has to be more to her? Or is it her self-proclaimed flag-raising air-headedness? Whatever it may be, I’m sure there’s more to her than meets the eye. Same goes for Izumi, the owner of CafeBar Bloomoon - which, by the way, is a real place - who’s so suspicious, I can’t help but think of him as a red herring though I probably shouldn’t. I could continue this list of suspicious people but it would include almost everyone. I have been a fan of Occultic;Nine’s pacing and suspense from almost the start but this episode was it’s most suspenseful yet. 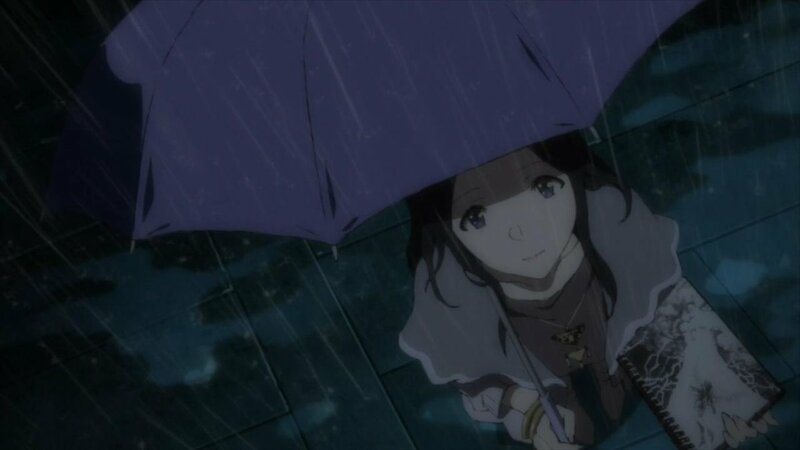 The pacing was much slower, one could even call it pensive for Occultic;Nine’s standards. The one we have to thank for that is Masashi Ishihama, who directed this episode. As I mentioned last week, he’s the director of Shin Sekai Yori so he has a way with creating mood and atmosphere using pacing, framing and direction. Next week, we’ll meet a new character, FBI agent and high school student Asuna Kisaki, who will investigate the case of the mass suicide. Given how much I like the other characters, I’m very interesting in meeting the Super High School Level FBI Agent. Furthermore, the next episode marks the first episode that is not available as a light novel since the third planned light novel was cancelled. Now really no one knows where this wild ride is taking us next. In one line: “She Took a Long Cold Look” proves once again that boxes in horror stories are always disturbing. As more characters meet, the plot thickens and gets even more complex. Moreover, by using various camera angles, this episode was deliberately designed to be disorienting. We saw the Kiri Kiri Basara gang getting and trying to piece everything together, much like us viewers for whom it seems to be virtually impossible to say where the plot is headed next, especially since the next episode will be the last episode to be based on the light novels. Episode director Ryouji Masuyama’s Dutch angles play their part in creating an atmosphere of mystery, in addition to the pacing and stellar music, all making for a worthwhile mystery thriller and I think I have cracked the C-O-D-E.
One of the mysteries will be revealed in the next episode - which has a lot of promise for various reasons which I’ll get to later on - as we’ll finally find out what the strange toothy key will unlock. We did see that it was a box, specifically a “kotoribako” - a type of haunted bird cage of Japanese urban legends - and that scares me. Boxes are never good news as Pandora’s box or Box of Spirits (one of the most disturbing and fascinating manga I’ve ever read) can attest. I don’t even want to begin to imagine what’s inside Occultic;Nine’s box and yet I’m more than curious to find out. What I did begin though, was reading the light novel series Occultic;Nine is based on and I’ve noticed an interesting titbit. “She’s Lost Control” was the first episode since the first one to (lightly) touch upon one of the light novels’ central themes: the relationship between fathers and their children. Seemingly every main character seems to have lost their father prematurely. Plus, their relationships were all either especially strained like Sarai’s or especially close like Gamotan’s and Myu-pon’s. The theme and its importance are much more prominent in the light novel which makes me thinks it’s not necessarily a hint at solving Occultic;Nine’s mysteries unless Nyarlathotep turns out to be the main antagonist and takes on the form of the Great Fathers as in Persona 2: Innocent Sin but a means to have the characters get to know each other better. Thus, while the fatherly theme may not be too relevant for the main plot, it seems to be a driving force for the characters to bond, as a throwaway line between Gamotan and Sarai indicated. I’m all for the characters bonding and interacting more, as I’m a huge fan of the pukey clever and fast-paced dialogue. It never feels obnoxiously clever, something that can be said about the anime as a whole. Last week, I theorised that the prophetic dream of the mass suicide was shared by all its victims but promptly dismissed it. Yet after this episode, I think I may have been onto something. During the conversation between Ririka and the creepy smile kid, he mentioned that he has seen her name in the news and that she didn’t think she would end up drawing herself while looking at a drawing of many people underwater, afterwards asking if where she is now could be the new world. This could mean that she is among the identified victims, hence her appearance on the news. Furthermore, this gives my theory more credibility so could it be that the occultic nine are all dead? Were they maybe hypnotised into committing suicide in order to create a Frankenstein’s monster out of 256 souls as Ririka implied? As this is a Shikura anime, I wouldn’t entirely rule out a pseudoscientific explanation but with every passing episode it seems more and more likely that Occultic;Nine will do its name justice. Speaking of Ririka, I’m not sure if she is simply an observer or directly tied into what is happening. She seems to have excessive knowledge on what is going on but that could also be explained by her clairvoyance. Then again, she’s definitely in cahoots with the kid, though I can’t say what his ultimate goal is. Similarly, Agent Moritsuke is an equally elusive character who follows his own agenda. He tampers with crime scenes, withholds information, is cunning and a master at mind game. Maybe he does so because much like his idol Zenigata in his pursuit of Lupin III, Moritsuke feels a compelling and driving determination to reach his goal, whatever that goal may be. I don’t doubt that he’s a chūnibyō but his driving force is something different than the fantasy of being a man on a mission. Then there’s also Zonko, the voice that comes from Gamotan’s old radio. Some speculate that it may be self-proclaimed airhead Ryotas who’s behind it, a theory I can neither support nor dismiss since someone calling themself an airhead raises so many flags but at the same time Ryotas being Zonko seems a bit too obvious, doesn’t it? Hmm. I mentioned that the next episode is very promising and not only because secrets are beginning to be unravelled. The next episode will be directed by Masashi Ishihama, who directed Occultic;Nine’s opening as well as one of my favourite anime: Shin Sekai Yori. I won’t spoil what Shin Sekai Yori is about but it’s one of the best unconventional horror anime I have ever seen and a true masterpiece. In equal parts profound and unsettling, it will haunt you long after you’ve finished it. Needless to say, I can wholeheartedly recommend it. Ishihama is immensely talented and I can hardly wait to see how his episode plays out. I’m especially intrigued about how he’ll handle the pacing, atmosphere and character dynamics. Man, I’m so hyped. Just the prospect of having Ishihama direct an episode is amazing. He seems like a great fit for the suspense horror that is Occultic;Nine. Next week’s episode can’t come soon enough! In one line: A deliberately disorienting episode hints at secrets slowly being unravelled. PS: Please watch Shin Sekai Yori. Occultic;Nine is a rollercoaster. It has its ups and downs but you generally like the ride if you are the type to like rollercoasters. It builds up an atmosphere of anticipation that makes you feel excitement and even dread at what’s going to happen next. No matter how prepared you think you are, the drop will happen sooner than you expected and it will catch you off-guard. Then it will begin anew. All that’s left is to enjoy the ride. As I explained in the previous entries of this blog, I have plenty of reasons to enjoy this ride. From the atmosphere and tension to the gorgeous art direction and character designs. Yes, character designs. Yes, one character has comically large breasts but the rest of her and everyone else’s design deserves recognition. I constantly find myself admiring how well-dressed the characters are. I need a parka like the one Gamon wears. I digress. The character designs are distinct and filled to the brink with style. Their outfits could easily be copied for real life purposes as well as for cosplays. Yes, one character has comically large breasts but to get hung up on that means completely disregarding pako and Tomoaki Takase’s lovely work. “Psycho Daisies” is heavy on the style but lighter, though not light, on the substance. Unlike the other episodes, this one didn’t give viewers any particular insight into the characters or what is going on. However, it gave us two very interesting pieces of information. One is, that Kiryū Kusakabe, the demon who “curses” people on Aria’s behalf, can project his astral body out of his normal one. It doesn’t necessarily mean that he is dead or that Aria can indeed communicate with the dead but it does further support that the occult is real in Occultic;Nine’s world, something NEET God Gamon strictly opposes. Given that this anime was created by the man behind the Science Adventure series that includes Steins;Gate, many believe that the clue to Occultic;Nine’s myriad of riddles will be science. Shikura, however, went on record to state that Occultic;Nine is not part of the Science Adventure series, so the worlds of, say, Robotics;Notes and Occultic;Nine are not set in the same world or universe. Semicolon be damned. Therefore, it is possible that the key to unlocking the mysteries Occultic;Nine holds are indeed to be found in the occult. Somebody call Doctor Strange. Observation two is much more obvious to spot but not less meaningful: Tōko is dead. It was obvious from everyone at her office ignoring her, plus her not having a reflection was a dead give-away (ha!). This itself wouldn’t be too noteworthy weren’t it for the fact that a.) Miyū talked to her after she died and b.) countless people committed mass suicide by collectively walking into a pond and drowning with only half the people that died having been identified. a.) further serves as an argument for the “occult is real”-theory but b.) is more meaningful. The implications of it are clear: Tōko (as well as the lost Chizu) could very well be one of the suicide victims. What makes this so intriguing is that Tōko had a prophetic dream about this. Is the dream connected to the reason why so many people committed suicide? Maybe everyone who did had the same prophetic dream and it really was a case of mass hypnosis? Then again, this would mean that Gamon and Ririka died in the incident as well which seems less than likely. My head hurts. Oh, the the side-effects of a rollercoaster ride but I can’t wait to take another ride on this peculiar rollercoaster come Saturday. In one line: “Psycho Daisies” raises more questions. I am absolutely in love with this anime. From the way it’s directed to the way it’s animated and designed, it is pushing all my buttons. Plus, this episode featured none (!) of the issues that plagued the first episode. No fanservice and no pacing issues, only heart-pounding suspense and paranormal horror. I feel sorry for those who dropped Occultic;Nine after its first episode. As it turned out, Aria was the girl from “Mummygatari” living with the corpse and ghost (?) of her older brother, a twist many saw coming since the different storylines had to converge sooner or later and “She Cracked” actually had a few intertwinings. While “Mummygatari” may not have worked out too well as a shocking turn of events, it did treat us to some excellent direction. During the flashback-scenes of Aria and her brother, you could notice that he had no shadow and no reflection. It was clear from the start that what we were shown was “Mummygatari” and that the brother was dead but the way it was subtly hinted at and hidden in plain sight was fantastic and well thought-out. Just another instance of Occultic;Nine’s backgrounds being full of life. While the “Mummygatari” twist was rather obvious, the cliffhanger at the end of the episode wasn’t, even though it was teased since the very first episode. The first episode’s Japanese title was たくさんの人 which translates to “many people” and that was also one of the first lines spoken by Yūta, who dreamed of many people underwater (hence the English title) drifting lifelessly. Tōko Sumikaze, the reporter, also had a similar dream, though she could only remember vague details. Although her thinking back of the conversation she had with the professor made it clear that her dream would have something to do with the plot, I was surprised to see it resolved by the end of the episode. Only to raise even more questions. Yūta, Tōko and mangaka Ririka - if she is to be trusted - all seem to have prophetic dreams but how are they connected to each other? Frankly, I don’t have the faintest idea and I’m loving it. We’re three episodes in and Occultic;Nine won’t stop giving us mysteries to puzzle over. How are they connected? Who was the kid with the creepy grin? Who was the guy with the creepy mask? Where is Chizu? Is the occult real? I can’t wait to find out and I hope Occultic;Nine manages to give us satisfactory conclusions to those and all the others questions it will undoubtedly raise. Pacing was a huge problem but it seems Occultic;Nine has found its groove and what a groove it is. What used to be one of its major issues is now one of its strongest points as the pacing and tone leave you positively breathless. This is how a mystery anime should be. I doesn’t give you time to catch your breath while still allowing you to effortlessly understand what is happening as long as you pay attention and Occultic;Nine demands attention. The advantages of the anime’s fast pacing would be wasted if viewers were to not watch closely but the production team is doing excellent job at forbidding viewers to look away. The animation is fluid, the colours are lush, the backgrounds are filled with details, the dialogue is (I don’t want to say snazzy but) snazzy and the music, oh god, the music. I need the soundtrack so badly. I digress. Everything works in tandem you give the viewers 20+ minutes of thrilling suspense. This is how you do a mystery anime. I can’t stress it enough because it’s been ages since I saw a show, any show, of the mystery genre that managed to end every episode with me trying to catch my breath. However, it’s not just the suspense elements that Occultic;Nine does well. It also has its fair share of horror. Horror isn’t just about being scary. According to Devendra Varma, horror is the stumbling against a corpse. Occultic;Nine seems to have taken these words very literally. Yet, shocking revelations aren’t all we are offered as the anime succeeds in creating an apprehensive mood fitting its different storylines. The confrontation between mangaka and detective was light, yet had an underlying tenseness to it, while Yūta’s dream (?) carried over its paranoid and oppressive atmosphere to the viewers and “Mummygatari” was like a dream that slowly but surely turned into a nightmare and I don’t think this nightmare is over yet. Far from it. Oh boy, I’m looking forward to delve further into the nightmare. In one line: Occultic;Nine knows how to do suspense and horror. Yes. This is what I wanted. Intrigue. Mystery. Suspense. This episode was riveting from start to finish and didn’t suffer from any of the problems that plagued the first episode. As expected this episode featured far less fan service, is far less frantic and is still adapting parts of the light novel series’ first volume. A lot of people were afraid that Occultic;Nine would just skip the first volume entirely and becoming really confusing but this isn’t the case. Also, don’t worry about the planned but cancelled third volume. After all, we still have Shikura’s vision. Well, maybe worry a little bit because he can be a little hit or miss. Or choose to go into it with an open mind. Or be cautiously optimistic because this episode was splendid. To be honest, I was a bit shocked at the reactions Occultic;Nine got. We had only seen one episode and yet a handful of people already formed a steadfast opinion on it. The first episode was what I expected it to be: a set-up for the general plot and characters that tried to draw in viewers. Did it execute those expectations well? No, it didn’t since the pacing suffered from crowding the episode with every single important character and the fanservice was very unnecessary and over-the-top. Interestingly, most of the criticism was addressed towards Ryōka’s Ultra C cup without getting to the real issue of it. People criticised the anime for Ryōka’s physique yet still disregarded everything else about her and dismissed her bubbly and charming personality. The issue isn’t that she has a made-up size that would cause her back to permanently ache but that this kind of fanservice has no place in this kind of anime. Thankfully, the second episode toned down the fanservice a considerable lot and, while it’s still there, it’s not as in-your-face anymore. This episode will surely have a lot of viewers stick around for longer than they had thought. I’m grateful the issues from episode 1 are largely absent in the second episode as it allowed the fast, clever and funny character interactions and the gorgeous art direction to shine. 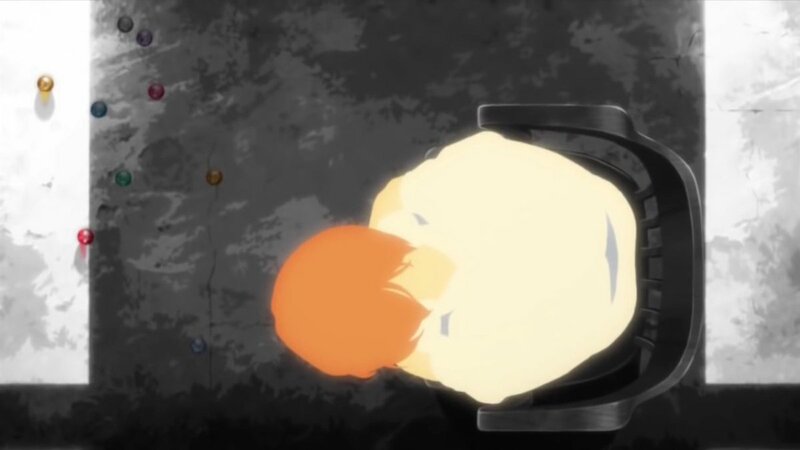 Kouta Michishita, the art director for this episode, has worked on the Monogatari series and it really showed, especially during the Facebook posts sequence which featured text over avant-garde imagery reminiscent of Shaft’s cult anime, emphasising just how out-there and haunting “Mummygatari” was. Furthermore, the backgrounds are a joy to look at, being full of little details that are fun to spot. The whole art design team is doing a fantastic job and deserves praise. All in all, I really enjoyed this episode. The first episode already showed promise and this episode lived up to it and what’s more, it lived up to my expectations, too. I was hoping for an occult detective anime that drives me so far at the edge of my seat that I’m running the risk of falling and this is exactly what I got. Bring on episode 3! In one line: With none of the first episode’s issues around, Occultic;Nine lives up to its promise. Thanks to its occult detective theme and being created by Chiyomaru Shikura, the writer behind Steins;Gate, Occultic;Nine quickly became one of my most anticipated anime of the season (the only other anime I was more excited about is Yuri!!! on Ice because I’m a fan of figure skating and I would watch anything Sayo Yamamoto directs) and I was let down I think but then I did enjoy it as well? First, some background information. The A-1 Productions anime Occultic;Nine is based on the eponymous light novel series by Shikura and is directed by Your Lie in April’s Kyōhei Ishiguro and newcomer Miyuki Kuroki. That alone is enough to have potential viewers excited. Interestingly, only two novels exist as the planned third volume of the series was cancelled only a few weeks ago. This may or may not explain some of the issues some viewers had with Occultic;Nine’s premiere. On a side-note before the actual write-up starts, I’m going to use the end cards as headers for each episode and credit the illustrators. Occultic;Nine is frantic. The pacing is incredibly fast and even messy, you’d think A-1 Pictures was trying to out-Trigger Trigger and failed. I had the feeling important plot points were just glossed over and as it turned out that is in fact the case. The pacing’s speed is something director Ishiguro even acknowledged and he recommends viewers tape the episodes so they could go back to them for future reference. However, the pacing wasn’t a big issue here as the trailer already made it seem like the anime would be quite hectic. The main issue was that this episodes, this first episode, rushed through the whole plot of the first light novel. This caused the whole episode to feel disjointed. Things happened. Characters were “introduced.” However, there was no - or at least it seemed like there was no relevance to the plot. A whole novel was crammed into ~20 minutes. Regardless, I still enjoyed what I saw. Maybe it’s my love for the Monogatari series but fast-talking, pop-culture savvy anime with occult components are kind of my thing. Yet, that personal preference is not all Occultic;Nine has got going for it. The characters that received proper introductions all were incredibly likeable and I love their character designs (apart from one aspect that everyone has already pointed out so I’ll not bother with it.) I thoroughly enjoyed the banter and character dynamics between blog-samurai Gamon, cute and bubbly Ryōka and moe medium (that’s what the official marketing calls her) Miyū. The writing was clever and the voice actors did a fantastic job delivering the lines with such energy that it simply carries you along. But it doesn’t carry you so far along that you wouldn’t notice that you don’t get a single thing that’s happening. Something that clearly stood out (no, not that) in this episode was the amazing soundtrack! Masaru Yokoyama did a great job with the score. It’s perfectly fitting for the spirited (heh) tone of the anime and the OP as well as the ED are simply unskippable. As I mentioned, the premiere episode blasted through the first volume and I’m very confused as to where it’s going from here. I suppose the remainder of the story could be told through flashbacks or maybe the anime will only loosely adapt the visual novels? As of right now, I’m very confused as to what happened, how exactly the characters are connected with each other and what will happen. Yet, I don’t really see this as a negative and the episode even reminded me of cult-favourite Paranoia Agent. Occultic;Nine is a mystery anime about the supernatural and science after all so a little or a bit more mystery and intrigue is absolutely alright with me as long as we get a satisfying conclusion and it’s much too early to say whether it gets one or not. I’m cautiously optimistic and very intrigued so I guess I’m hooked. Well, maybe not hooked. I’m intrigued. Yes. Let’s say I’m intrigued. In one line: A very messy, yet equally intriguing first episode. 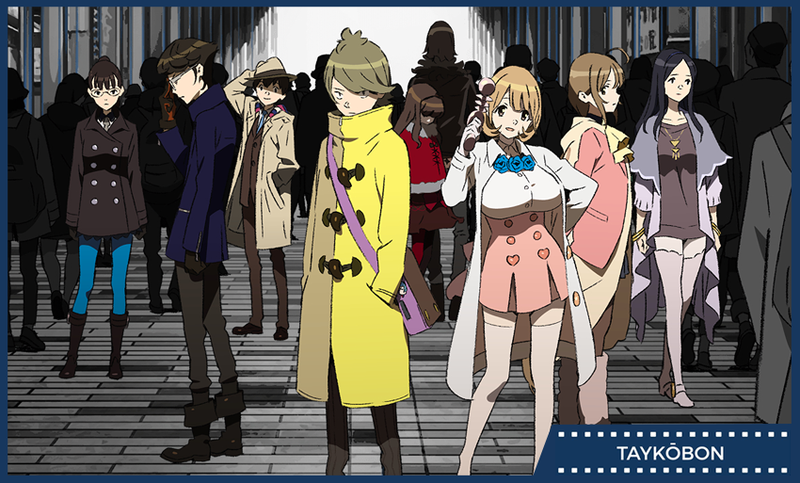 Occultic;Nine is produced by A-1 Pictures and airs during the fall 2016 anime season. It is based on the eponoymous light novel series by Chiyomaru Shikura, was directed by Kyōhei Ishigur and Miyuki Kuroki and written by To-Jumpei Morita.